Taste WA is billed as the largest single region focused wine event in the world. The sheer magnitude of the event cannot be appreciated until you experience it “in real life.” To get ready for this year’s event I followed all the pro tips: I did some research, I made a plan, I created a map and dialed in my game plan. Then I walked onto the convention center floor and immediately forgot everything! I wandered around aimlessly for about 15 minutes before I snapped back to reality and regained my focus. Time to execute the game plan: Focus on wines from the Ancient Lakes AVA. Recognized in October 2012, Ancient Lakes is Washington’s newest AVA or American Viticultural Area. (Naches Heights was recognized in January of 2012 to October for the Ancient Lakes.) The AVA is located just to the East of the Columbia river covering 162,000 acres that span Grant, Kittitas and Douglas county. As a reference point, the Gorge Amphitheater is situated on the Western edge of the AVA. There are roughly 1400 acres of vineyards planted primarily to white wine grape varieties including Riesling, Chardonnay, Pinot Gris and Gewürztraminer. You will also find some red wine varieties, but these are limited due to the cooler temperatures. The Cave B estate vineyard is home to some of the older Cabernet Sauvignon vines in the state. The AVA is unique in a couple ways, it's soil composition. Deposits of clay, sand, silt and Caliche were left behind when floods from the Ice Age drained into the Columbia River. The site is cooler in comparison to some of Washington's warmer growing areas, namely Red Mountain, the Wahluke Slope and even Walla Walla. This makes for a good climatic option for white wine grapes, and Pinot Gris, Chardonnay and perhaps most famously Riesling are doing very well here. It is also an area where we are seeing growers experiment with Pinot Noir though it is far warmer than the Gorge or Oregon's Willamette Valley. Given it's placement along the Columbia River Gorge, the Ancient Lakes also holds the most dramatic views of any Washington AVA. The Evergreen vineyard, owned by the Milbrandt family, is one of the largest and better known vineyards in the AVA. It is particularly popular for Riesling and might be the source for some of the state's best Riesling bottlings. The Charles Smith Kung Fu Girl Riesling and Efeste Evergreen Riesling both feature grapes from Evergreen. 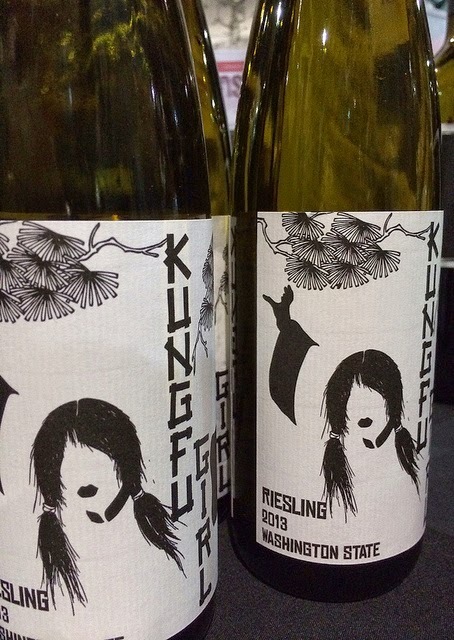 The 2013 Kung Fu Girl Riesling starts out with sweet notes of pineapple and star fruit that are balanced out with some tasty, tart acidic notes of green apple that follow through with a round house acidic kick on the finish. The 2012 Efeste Evergreen Riesling fires off with more zip on the front end with initial notes of green apple followed by some kiwi, pineapple, tart honey dew melon rind and hints of lemon zest leading to a well structured acidic finish. Both of these Rieslings were well balanced with just the right amount of heft and a bold streak of acid that leads me to believe they will be great paired with some spicy thai food. 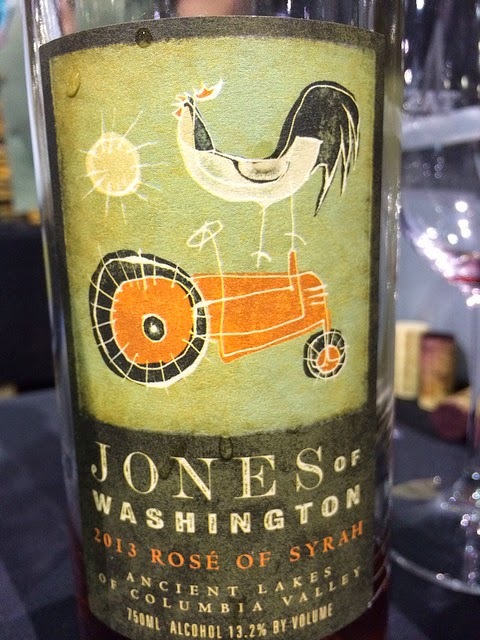 Jones of Washington owns two vineyards in the Ancient Lakes AVA. Their Two Gun estate vineyard covers about 140 acres and is home to Riesling, Gewürztraminer, Pinot Gris, Syrah and Pinot Noir grapes. Rhett Humphrey was on hand to pour their Pinot Gris and rose’ of Syrah both made from 100% estate grown grapes. The 2013 Pinot Gris was just bottled in February and shows notes of pear, pineapple and peaches along with complimentary tart green apple that brings a dry streak of acidity to the party. The Rose of Syrah has a touch of Pinot Noir blended in resulting in flavors of strawberry, light cranberry, raspberry and tart huckleberries. This rose is dry and is backed by (what I am beginning to learn is) that familiar Ancient Lakes acidity. 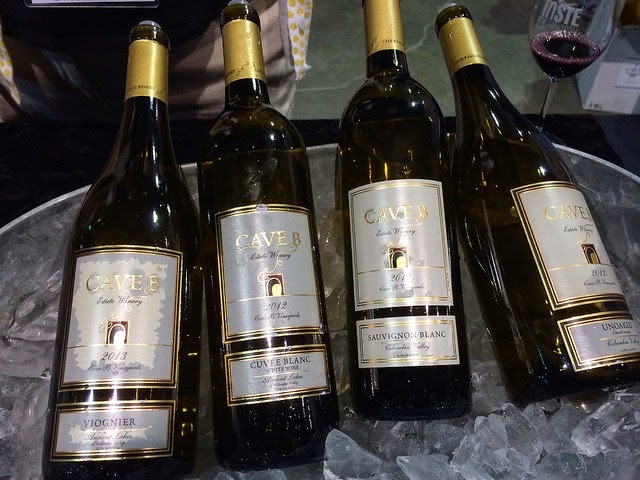 Cave B is another well known vineyard and winery located in the Ancient Lakes AVA. They were the only winery at Taste WA pouring red wines from the Ancient Lakes. I spent some time talking with their winemaker, Freddy Arredondo, and he explained how you have to really focus on vineyard location to find the right spots for these grapes to ripen. I tasted through their extensive lineup of wines including a Syrah, Tempranillo, Merlot and Cabernet Sauvignon. The 2010 Merlot and 2010 Cabernet Sauvignon are both designated as “old vines” and are made from vines that are 25 years old. The Merlot was showing rich cherries, earthy light menthol spices and some subtle herbal notes of thyme, mint and sage. The Cabernet Sauvignon had notes of dark currants and earthy funkiness with abundant tannin showing that this wine has years ahead of it. There you have it. With over 200 wineries on hand there was plenty to choose from at Taste WA. It gave me a great opportunity to learn more about the new Ancient Lakes AVA by visiting with several winemakers and tasting their wines. The acidity and tannins apparent in all the wines I tasted showcased the character for our newest AVA. The day was also a good reality check to see that there is more going on in the Ancient Lakes than just white wines. If you enjoy wines with a streak of acidity, I would highly recommend seeking out wines from the Ancient Lakes. Thank you for your wonderful post on the Ancient Lakes AVA. The award winning whites and reds coming out of here are very exciting.